Goodbye Winter with Einstok Winter Ale on Tap - Oak Beverages Inc.
Goodbye Winter with Einstok Winter Ale on Tap, Tuesday, April 16th, 7pm – 10pm. 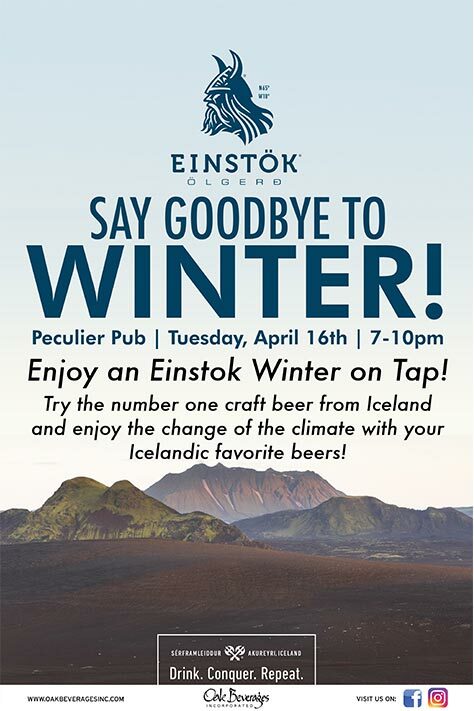 Say goodbye to winter at Peculier Pub with an Einstok Winter Ale on tap. Of course, the drink of choice is one of the fine ales crafted by Einstök, but, while we seek to gulp every last drop of life, we savor our beer and drink it in moderation, respecting not only the great skill with which it was made, but also our fellow Vikings and our responsibilities as citizens of this earth. The world is a place of discovery and adventure and the modern Viking seeks to experience as much as possible. But, when we conquer new lands and new people, it is not with the goal of pillaging them, but rather to leave them better than we found them. When it gets this good, you can’t help but do it over and over. We are talking here, of course, about repeating the thrill of adventure and about continually seeking new experiences. And, while you will likely be tempted to repeat the refreshingly drinkable experience that comes with Einstök ales, please do so responsibly. Peculier Pub was founded over thirty years ago during a time where most places in NYC were limited in the types of beer they sold. Our bar became the first beer bar in NYC, stocking hundreds of different beer from around the world in order to expand the appreciation of different brewing styles and regional specialities. Symbolic of the owner’s original desire to broaden the beer drinking experience of our customers, our name comes from a beer originating in England called Theakston’s ‘Old Peculier’, which was the owner’s favorite beer when he first opened the bar. This tradition continues with our stock of over 350 different beers in bottles and 27 beers on draught. Ever wonder what’s with the old pew-like seats and stained glass windows? These are remnants of the bar prior to Peculier called Preachers. Peculier moved from a location on West 4th about twenty years ago (now ‘The Slaughtered Lamb’), keeping the lovely decor from Preachers. Want even more of a history lesson? Before Preachers, 145 Bleecker Street was a pub called “The Dug Out.” Before that…? A bible shop owned by two sisters. Overall, this location is over 100 years old! God bless this mess! Posted in Featured Promo, Tap Attack, Tap Takeover, Tasting Event.